New York's People of the Stony Shore, the Shinnecock Indians, have finally been approved for federal recognition, which would allow them greater weight in some of the land disputes they have faced in the surrounding Hampton area—which, by the way, is playground/getaway for the wealthy. A follow-up article has reported that the Shinnecock have plans to build either a Class II (slot machines only) or Class III (tables permitted) casino now that they have been federally recognized. formally establishes a government-to-government relationship. Status as a sovereign entity carries with it significant privileges, including exemptions from state and local jurisdiction. These exemptions generally apply to lands that the federal government has taken into trust for a tribe or its members. Additionally, federally recognized tribes are eligible to participate in federal assistance programs. Through these programs, tribal governments may receive funds that they can then use to provide community services, such as health clinics. But this isn't a post about the patrons of these establishments. 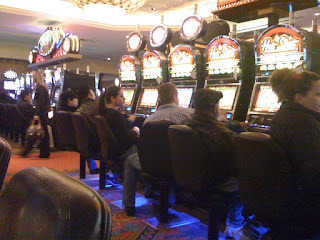 I understand the Shinnecock view the casino as a source of revenue, but is it the only source of revenue available to our remaining recognized Indian tribes? It seems that this is a prescribed course of action—at least in this area. Yes, it provides jobs, and funds for the community, but ... I don't know. Are there any other means for Indian tribes to become economically viable? I guess we'll have to wait and see how this unfolds. The slot machine facility I visited was in close proximity to an urban area, which meant its clientele was slightly different than the other places I mentioned. Perhaps that's also a factor in the successes of these types of endeavors. UPDATE: The NYT featured an article on the debt incurred by the Pequot tribe in managing Foxwoods on Monday, Jan. 10th.